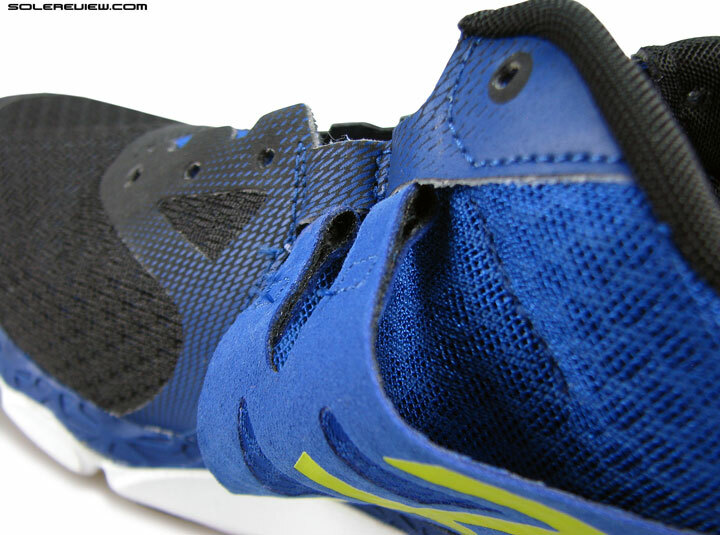 Upper: Mesh, synthetic nubuck overlays, TPU welds, floating midfoot and heel panel. Outsole: Hard AHAR carbon rubber. Avoid this shoe. Midsole flexes in all the wrong places, the transition isn't great, upper fit is inconsistent, and it packs in more weight than it should. Quality of finish will make you cringe. So here we are. The 33-DFA is the last shoe to be reviewed in the 2015 Natural 33 pack, its $90 tag being the minimum price of admission into Asics’ 4 mm differential club. It is also the most minimal of the trio (33-M, 33-FA) when it comes to cushioning softness and midsole stack heights. The upper also runs tighter than the other two ’33’ prefixed models, an outcome of a variation in upper design. Spend your $90 somewhere else. It is also the worst shoe in the 33 series line-up. We can’t think of even one compelling reason why you should buy the 33-DFA. As a matter of fact, we can think of more reasons why you should not buy this product, and one of them happens to be a definite deal breaker. Only two things work in Asics 33-DFA’s favor, and those would be its sub-$100 retail price and the quality of heel cushioning. If you really want to wear one of the natural 33 models, then make it so with the 33FA. Need a cushioned, lightweight 4-6mm drop neutral? Try the Zante instead. It would be wise to avoid the 33-DFA entirely, and instead spend $20 more on the 33-FA, which comes boxed with hardly a fault worth nitpicking. If you want minimal midsole stack heights with cushioning to go, then buy a plane ticket out of the Japan towards the West. Our recommendation for a cushioned, 4-6 mm drop lightweight? The superlative Fresh Foam Zante, without a doubt. Or even the 4mm drop Nike Lunarlaunch. That’s a pretty strong statement to make about a shoe so early in the review, but that’s the whole point of writing one, isn’t it? Lay out the plot early on, and then break it down into pieces. What follows is the detailed review to take a microscopic look at what works, and more importantly, what does not. Like the rest of the 33 series, the DFA comes with a 4 mm heel to toe drop. A quick round-up of basics is a good way to get to the task, then. The Natural 33 series line has a common denominator, and that’s a 4 mm heel to toe drop. Segmentation across models is achieved most through variation in midsole stack heights, with 33-M occupying the top slot in foam volume, and then downstream across the 33-FA and 33-DFA. The heel drop is all what Asics believes qualifies a running shoe as natural, regardless of factors such as the 33-M’s prodigious 374 gram/13.2 ounce weight. Brands have their own interpretation of what counts as minimal, and this seems to be Asics’ way of looking at things. 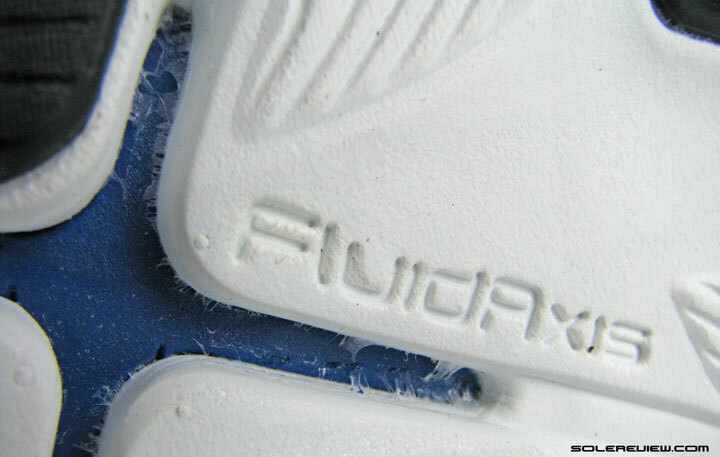 The DFA midsole is seen here with its dual stack of soft and firm foam. A 4mm drop is standard across the 33 series. 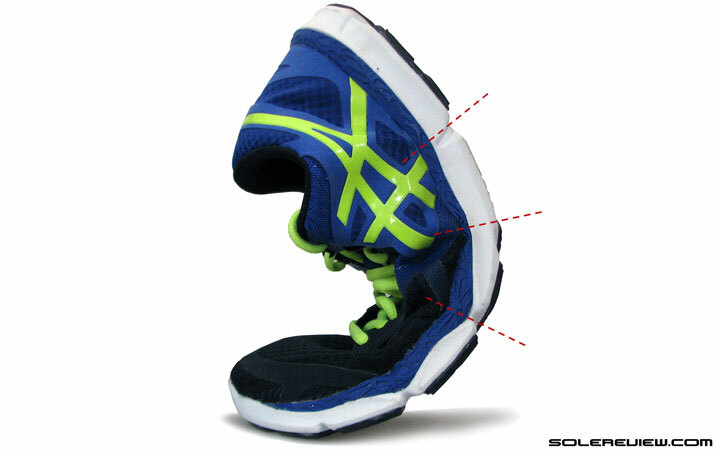 In line with Asics’ approach of differentiation, the 33-DFA measures at toned down forefoot and heel heights of 10 mm and 14 mm respectively (brand specified, but the actual thickness feels higher). The obvious idea is to make the 33-DFA feel more minimal compared to its relatives up in the natural 33 food chain. Logically, its weight should be far lesser than that of 33-FA – given that a substantial 80 gms/2.8 Oz separates the latter from 33-M.
Not exactly lightweight, this one. Weighs nearly the same as the visually bulkier 33FA. Yet the 33-DFA is heavy on a relative scale, only a mere 6 grams/0.2 Oz lighter than the 33-FA. Because while the midsole heights might have dropped, there is still a lot of layering on the upper. In certain places, the 33-DFA upper is certainly more bulky than the 33-FA, by way of introducing design elements specific to this model. Not to forget, there is plenty of meat on the sole too. Dual density foam, and the bottom has no dearth of rubber. The upper combines a few mesh types together. 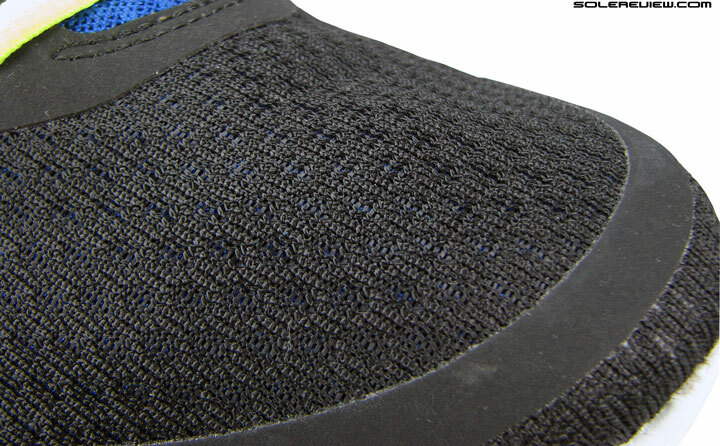 Forefoot has a closed knit fabric. There is extra layering on the 33DFA. Both sides have a floating support panel. 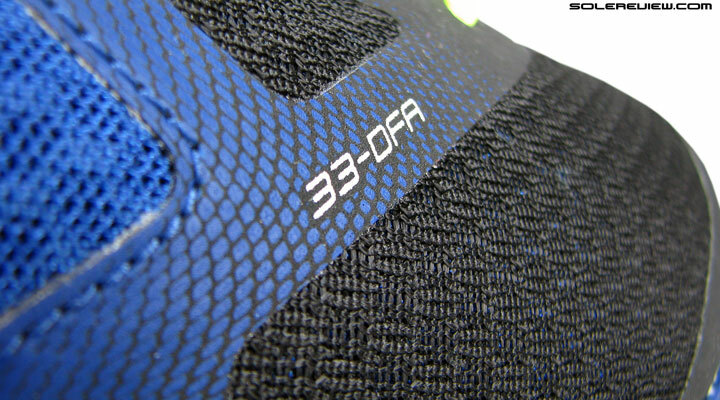 Ingredients of the 33-DFA’s upper include three different kinds of mesh (not counting the lining), and show up depending on which area of the 33-DFA you’re staring at. The front uses a closed kind of fabric, followed by a softer mesh in the midfoot and heel, and over the tongue. Now if you pay attention to the going-ons in the midfoot and heel, then you will realize that the 33-DFA is dual layered in construction, and there it uses the third type of mesh we just referred to. 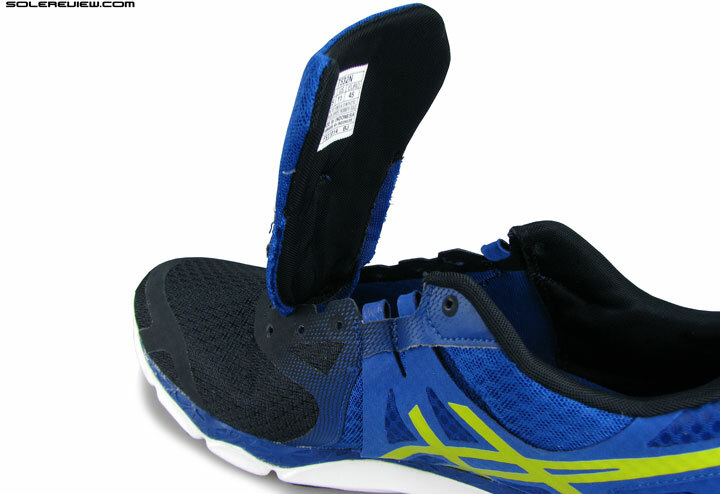 Floating straps on either sides, with the design goal of better midfoot lockdown. But do these work? 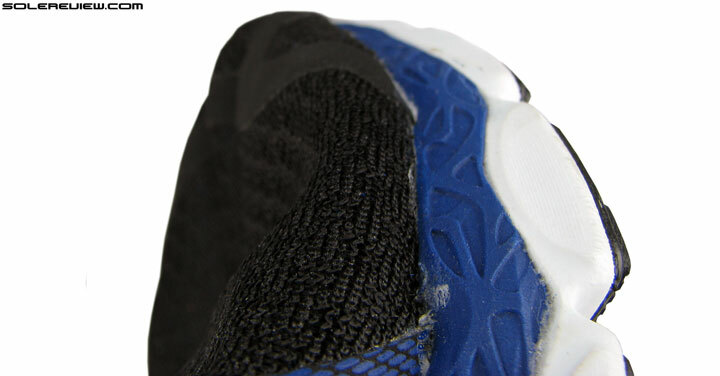 An additional panel built of synthetic and thin mesh floats over once the shoe is past its midfoot point. This goes right around the heel and clasps the other side of the 33-DFA. An useful fact to know is that the lateral panel is completely free of the main upper except for being tethered at the collar and midsole edge. This creates an empty pocket between the upper; big enough to slide in two folded $20 crisps or a single house key. True that, no kidding. The independent panels funnel up to form a loop. This is the lateral (outer) side, where there is a single lace-loop. On the medial (arch) side, the panel splits into twin lacing loops. And what value does this strap bring? To answer that question, let’s go over its intended design goal. The top of the panel converts into lacing loops on either sides, with a slight variation in execution. On the outer (lateral) side of the shoe, the synthetic morphs into a single strap, while medially (arch side) there’s a set of twin straps. Both those loops are held down by a guide which is part of the main upper. The laces pass through them, so on the face of it, the objective appears clear enough. That to increase the intensity of midfoot fit. But does it work as supposed to, and if so, does it work well together with the overall quality of fit? We will circle back to this topic, but after going over some of the other sections. 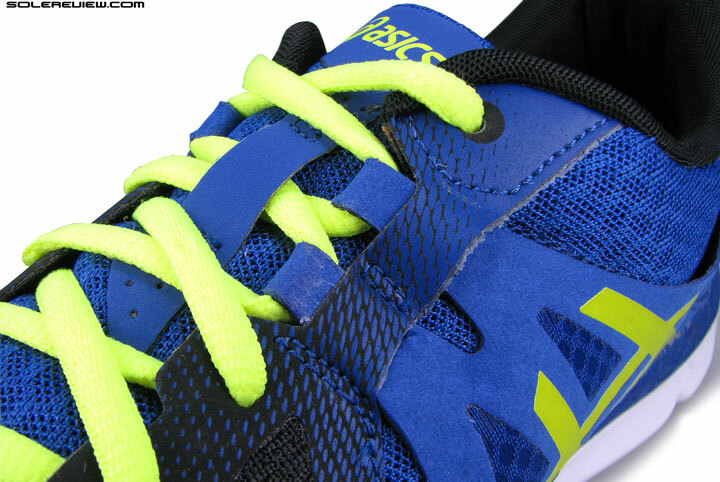 For after all, components on a running shoe seldom work in absolute isolation, and the same can be said of this strap. 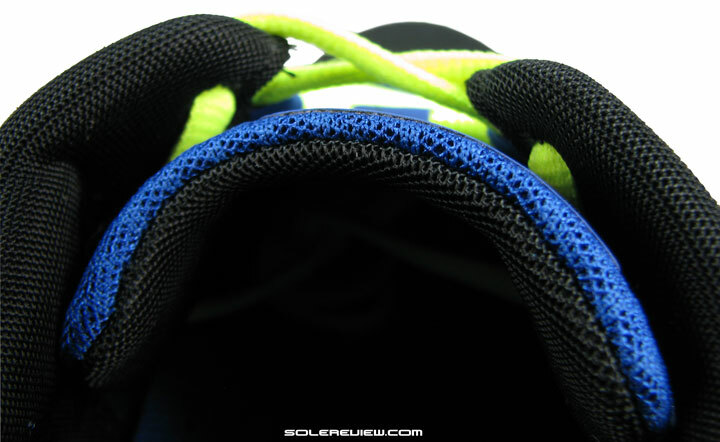 The insole sits squarely on top of the midsole, and makes the forefoot shallow. Either sides of forefoot do not have any overlay. The toe bumper has a strip of stitch-less synthetic running over it. 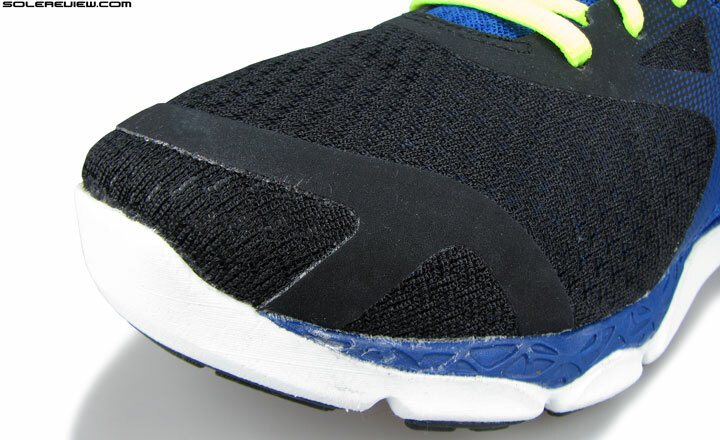 Sideways forefoot fit is snug, but since it’s mostly mesh, no unruly overlays cause boxing in of the foot. The 33-DFA runs true to size, with a comfortable margin of room right at the tip. 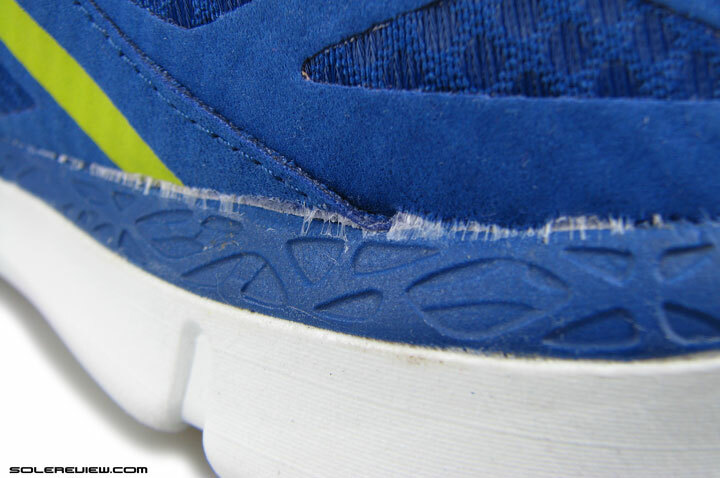 But the entire forefoot is shallow, and we see the space erosion coming from the removable insole. It sits high on the midsole instead of resting in a shallow curve, and that kind of design eats up into space real quick. 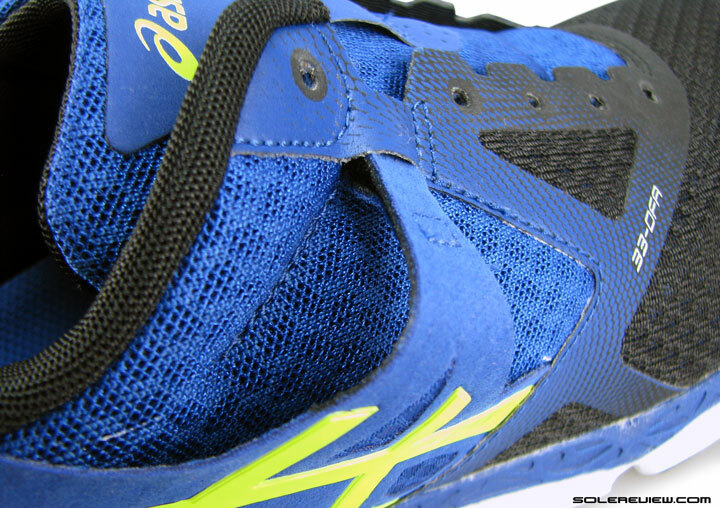 If you fold the forefoot mesh flat over the edge, you’ll notice the insole bulk pressing against the fabric. Basic heel lining and cushioning material. 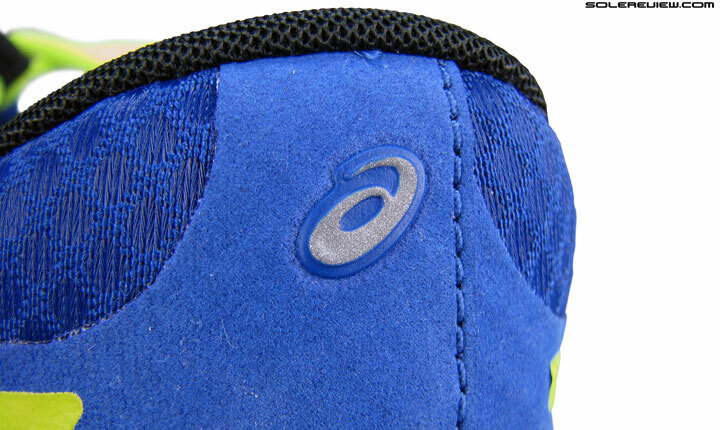 Like the 33FA, the heel can be completely flattened out as it lacks an internal heel counter. Teeny weeny smidge of reflectivity. In the back, the 33-DFA depends on a fully collapsible heel area to counter the foot. The package of collar fabric and padding isn’t much to write home about, yet there is no cause for complaint when it comes heel slippage. It grips well enough. Like in the 33-FA, this relative rarity of heel construction will help runners struggling with a sensitive Achilles Tendon. 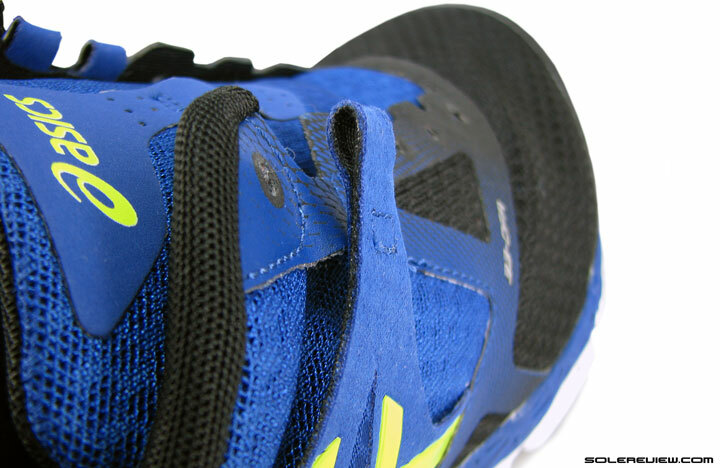 And perched right on the heel top is a tiniest piece of reflectivity we’ve ever seen on a running shoe. More at home in Lilliput fable-land than on human foot. Tongue is thin, and is narrow across. The tongue has a barely there foam fill, very basic. It is a step down from the 33-FA’s inner sleeve integration, and is completely free of sideways attachment. The result of this design is a very predictable tongue slide, and while that looks undesirable from a visual perspective, it works against the floating strap design. See, what did we say about isolation? We’ll spend some more time on this aspect a few paragraphs later. That’s a lot of material, but we did not feel the pattern to be correctly positioned. 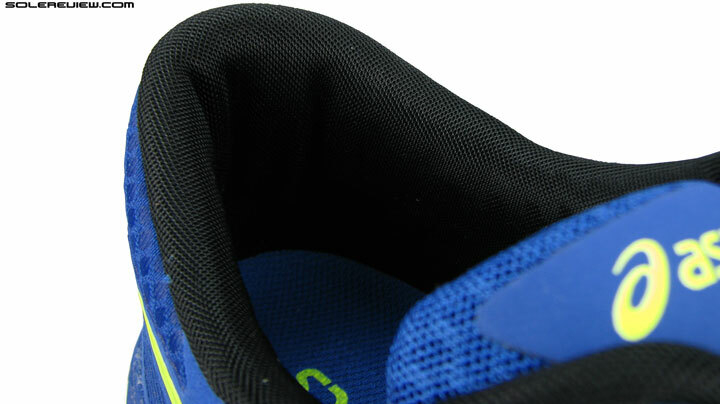 The lateral strap (pictured) sits a little behind the midfoot which decreases its efficacy. As for the floating strap itself, its effectiveness is cramped by a couple of things. Firstly, we see the panel begin a bit later in the midfoot than it should, nearer to the heel. On the lateral (outer) side, that is even more so, and struggles to make itself useful. Once laced, the panel does not even sit flush with its base. Even after a solid tug on the strings, the front portion of the lateral strap refuses to lie flat. There remains an opening big enough to slide your pinky finger through. 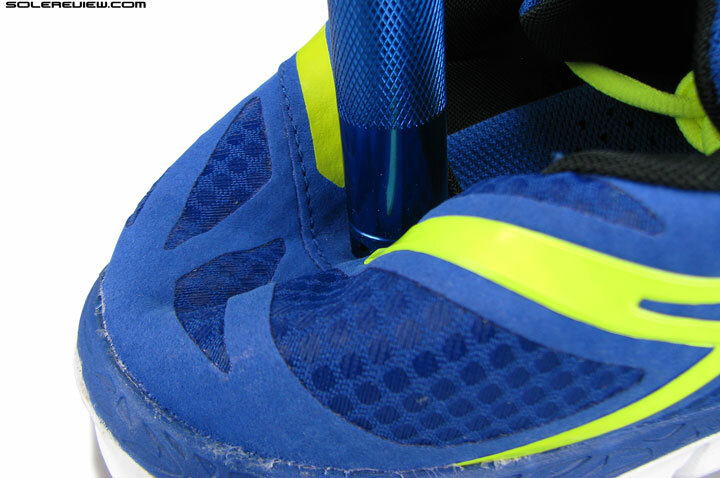 The medial side straps also fail to deliver the (visually) promised level of midfoot grip. Seamless? Not quite. 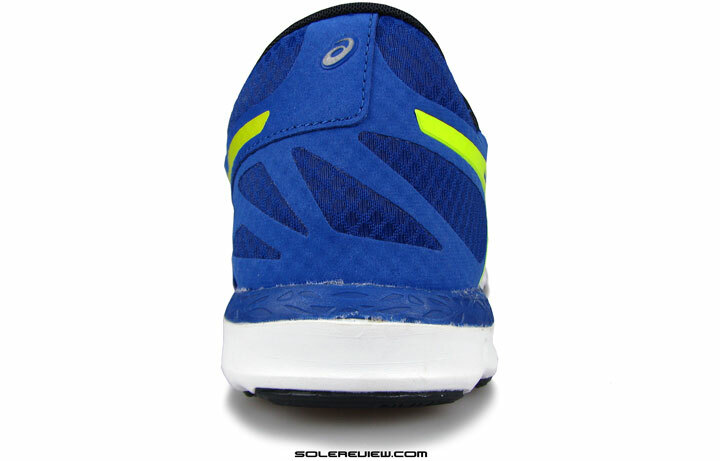 Deep inside the upper (look at top right part of image), a bulky seam joins the forefoot and midfoot section. On the arch side of the shoe, the position of the panel moves forward, but suffers from the same issue. Pulling on the laces does not exactly improve the level of midfoot wrap. Ironically, the tightest part of the medial midfoot is not where the panel is, but a little before it. This is the place where the forefoot and midfoot mesh meet. The 33-DFA uses a strip of synthetic on the outside, and a seam reinforcement on the inside to join these two areas. Asics throws the word ‘seamless’ around in describing the 33-DFA, yet there’s a thick seam which is placed in an area with maximum side pressure. 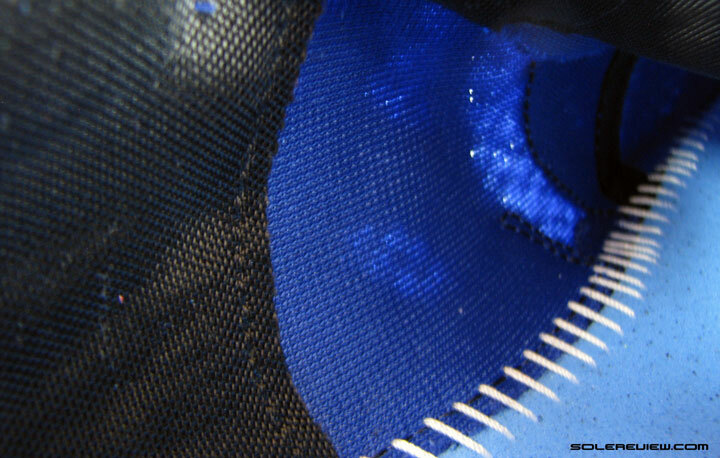 The loops are formed by folding the material over, and this makes the eyelet panel thicker. Hence this section of the medial upper feels much snugger than where the strap is. And here’s the thing: you can’t cinch the laces too tight, because that results in another unwanted side effect. The tongue has minimal cushioning, so the pressure from the straps presses down on the top if you apply too much pressure. The other angle to this involves the tongue slide. Only stitched to the front, so the tongue slides massively. Lack of a sleeving leads to the tongue sliding aggressively, checked only by the lacing guide from disappearing sideways. And 100% of the time, tongue slide follows a definite pattern. It will move to the lateral side of any shoe, leaving lesser material on the arch (medial) side to pad the foot from lacing pressure. 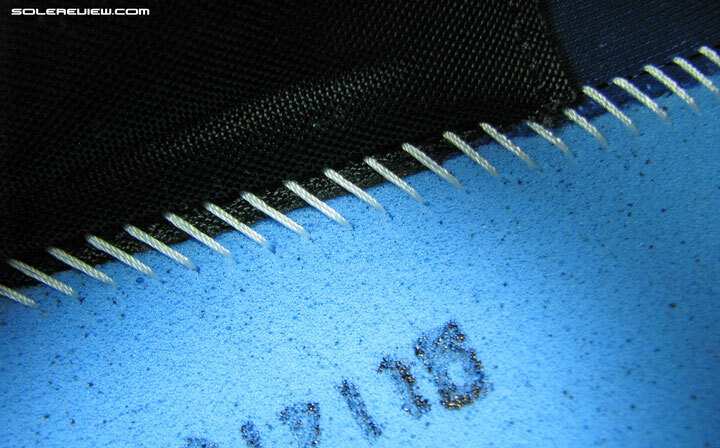 Now recall that the medial side of floating panels has two lace-loops – which applies a higher level of pressure. This is beauty shot mode, but while running, the tongue slides to one side and the twin loops apply uncomfortable top down pressure. So when the tongue slides, that means lesser padding under the tighter cinch of the strap, as the tongue edge comes closer to the eyelet. 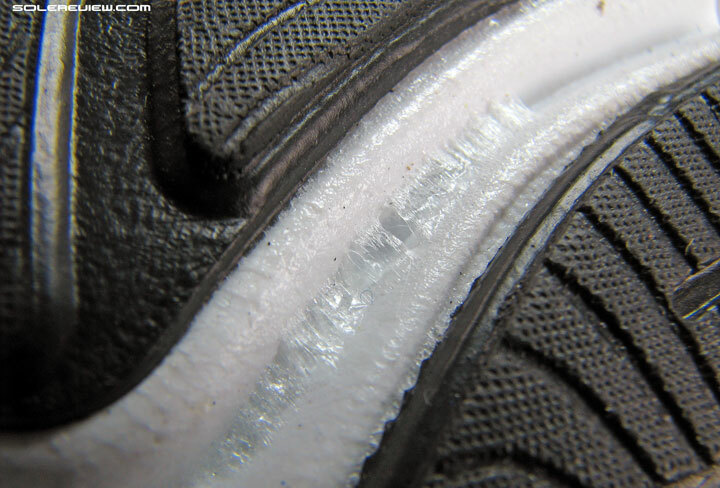 The net result is a noticeably higher lacing pressure localized in that area. Just too much pressure on the top of the foot as different materials and layers jostle to do something of their own. This inept behavior of the floating panel misses the whole point of providing side grip. The additional component with its fancy straps add zero value to the fit; it is a visual placebo at best. The midsole side profile sports the shared natural 33 aesthetic. That’s the smooth walled EVA midsole base clasping a softer foam sheet placed above it. Asics has a new name for the softer foam: Amplifoam. We’ll reserve our opinion on its standalone cushioning properties till we’ve reviewed a few more shoes with instances of this supposedly new material. For now, all we can say with certainty is that it feels soft to run in. The ‘Fluid Axis’ design which splays and increases responsiveness. Unlike the 33FA, the front is filled up with plain EVA here. With its lower stack heights, the soft and harder midsole combo yields a stable and neutral ride. The cushioning sensation is more pronounced in the heel than the forefoot, since the 33-DFA employs the ‘FluidAxis’ concept, but only under the heel. Thus the heel splaying creates an elevated cushioning feel, but that courtesy does not extend to the filled out forefoot. …but the reverse is compression molded EVA instead of the Comfordry material. Increased firmness here, less squish. Lasting material is Comfordry foam, same as 33FA and 33M. Things are set-up a bit differently from the 33M and FA when it comes to the insole. Both of the aforementioned models had a Comfordry sockliner made of lighter density foam, but in this case the insole is a molded solidity of compression formed EVA. 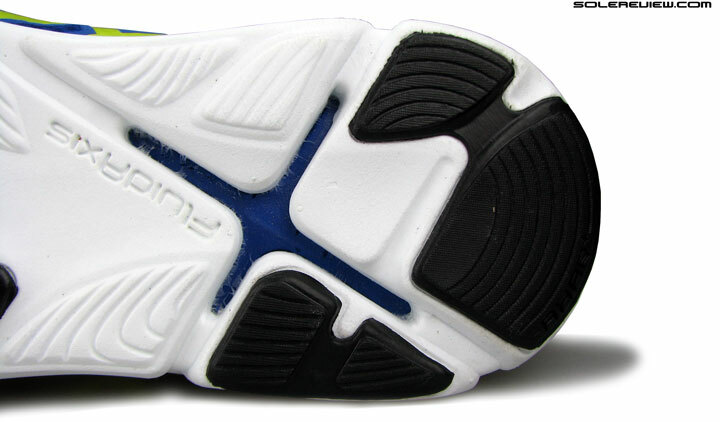 As a result, the ride gets firmed up when this insole and the reduced midsole thickness combines. Strobel is identical as the other two series 33 shoes, making use of the open celled Comfordry lasting. Quality of transition isn’t very smooth. Some of that can be attributed to the softer heel and not-so-soft forefoot, but the real reason lies in how the outsole is designed. Multiple slabs of huge flat rubber dominate the forefoot and heel landscape, while leaving the midfoot conspicuously barren. 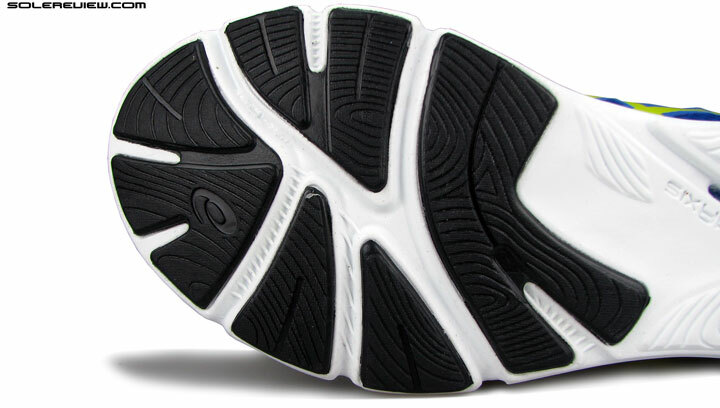 And if you were to hold the shoe outsole at eye level, you are bound to observe that the entire midfoot sits slightly lower than the forefoot and heel. This isn’t good news when it comes to facilitating a smooth gait cycle. Weight loading happens rather awkwardly heel to toe or the other way around, with a large expanse of mushy emptiness interrupting transition. But hey, we would be willing to let this slide if it weren’t for the single biggest deal breaker on the 33DFA. 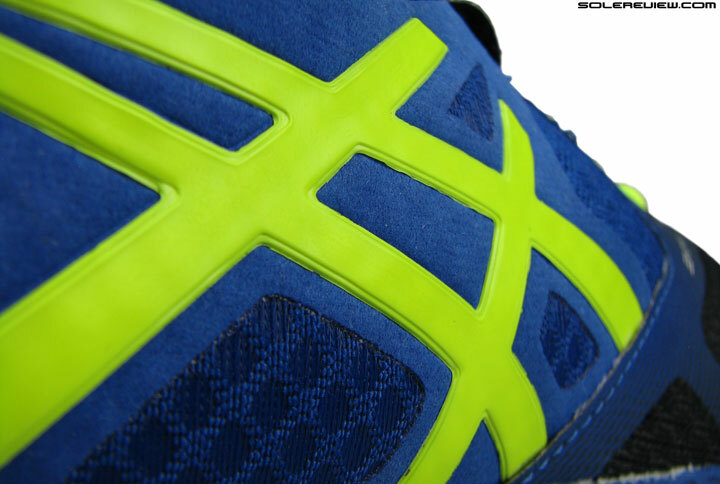 The Asics 33DFA has more flex in the midfoot than forefoot. Design fail. The peculiar outsole layout leads to an unnatural flexing behavior. With the forefoot completely reinforced with hard rubber, bending the shoe results in flexing happening along the path of least resistance – the midfoot. So how is this wrong, vs. something like a Nike Free which has a much more liberal degree of flex than the 33DFA? The issue lies in the way the DFA bends. In an ideal scenario, the forefoot should be the most flexible part of the sole, followed by stiffness gradually increasing along the midfoot to heel. Here, the midfoot is easier to bend than the forefoot, which is a no-no. Actually we did not notice this till our third run in the 33DFA, when we started feeling a dull Plantar pain. That planted a seed of doubt as regards to the 33DFA’s flexing behavior, and a quick, manual flex test confirmed our fears. Needless to say, the 33DFA got quickly pulled out of the wear-test rotation. Runners with optimally conditioned Plantar will not feel it during shorter runs (5-10 k), but we don’t recommend running longer than that. And needless to say, when the 33DFA is paired up with a recovering PF, it certainly won’t be a joyous union. Runners falling in this category would do well to remember the concealed upper pocket we spoke of. The tucked in $40 would come in handy after this shoe wrecks your Plantar and you need to hail a cab to drop you home. The wisest thing to do is to stay clear of the 33DFA altogether. After all, what does the 33DFA do what a Zante or Nike LunarLaunch won’t do better? There are many ways of ensuring injury free running, and not buying the 33DFA is one of them. Still enamored of the natural 33 series? Then spend your greenbacks on the $110 33FA instead. Look at all that excess glue. Quality control must have been on flight mode when this shoe was being assembled. More in the splay area too. No, this does not help outsole grip. Gives a new meaning to the word Fluidaxis, doesn’t it? If all this wasn’t bad enough, our 33DFA showed up with a quality of finishing and assembly which was absolutely third rate. Excess glue is visible everywhere, as if it was going out of fashion tomorrow. Either that, or the factory had more glue than what they knew to do with. 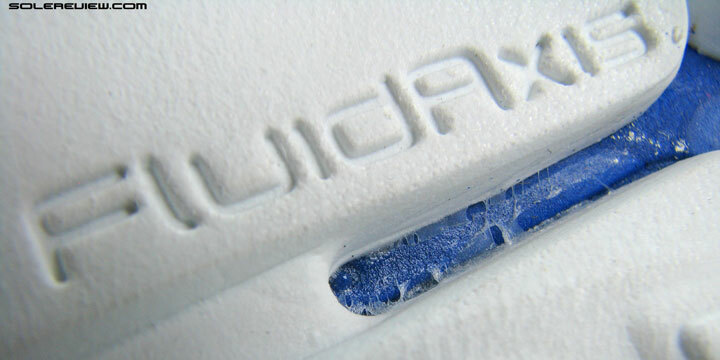 Along the upper and midsole edges, and remnants of dried glue in the outsole cavities give the term Fluid Axis a new meaning. We haven’t seen this level of shoddiness on either the 33M and FA, nor the Nimbus, so does it mean that cheaper Asics models are given the hall pass when it comes to quality checks? Some might want to defend this as a chance occurrence, but pictures don’t lie, and we have a full price receipt of $90 to prove that this shoe was shipped for regular retail. 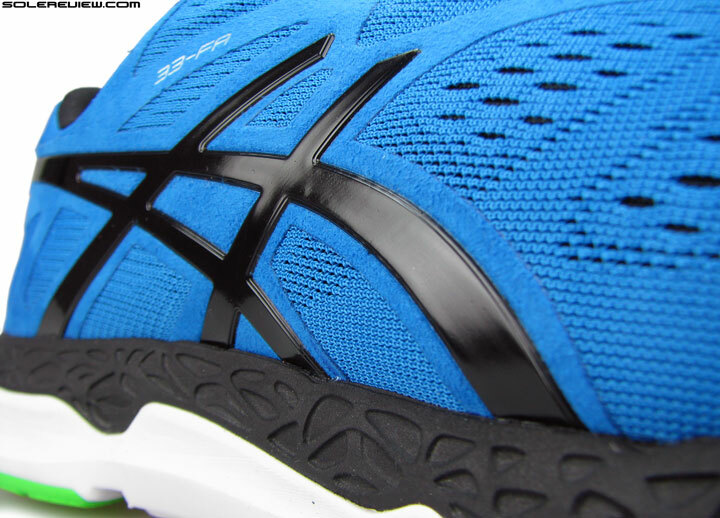 After testing the entire 33 series line, it would seem that Asics designers have poured their heart into the 33FA, with the plus two (33M and 33DFA) being an after thought. Ok, the 33M is not bad, just plain average, but the 33DFA screams incompetance from every fibre of its being. We don’t particularly enjoy bashing a shoe we’ve paid good money for, but a job’s gotta be done here. This shoe earns a rightful place in the rogue’s gallery. The plantar wrecking midsole is poor footwear design, and the shockingly shoddy finishing makes $40 supermarket running shoes look like 15th century Renaissance art. There are a few areas where the 33DFA’s performance is passable. But when it comes to sheer poverty of footwear design best practice, there is simply no comeuppance. Doesn’t the Zante have a 6mm drop? Thanks for the spot, corrected! I picked up a pair of the GT2000-2 this week after reading your fantastic in depth review and love them- and the construction is top notch. 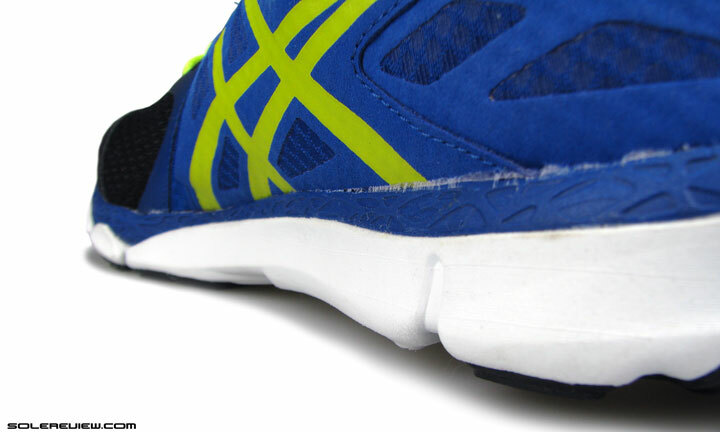 We’ve also had a smooth ride (on fit and finish) so far with Asics, with the exception of GT 1000 2 and this one. I’m tempted to buy this shoe just to see the terrible-ness in person! Thanks for saving me $90. I was really going to try either this one or the FA this year at some point, but I’ll just snag another pair of Zante’s when it comes to it. If you need to buy a Asics 33 shoe, the FA is the one to buy. That said, you can’t go wrong with the Zante! To make a shoe worse than the Tempo 7 Boost must have taken some effort! Hey! Great in-depth review as always! Are you guys going to be reviewing the Nike Flyknit Lunar 3 anytime soon? Also could you reccomend any shoes for a forefoot striker that I can put some mileage on? Thanks! Yes, this month. If you can’t wait, here is a quick round-up of changes on the Flyknit Lunar 3: same midsole/outsole, improved forefoot fit, sleeving removed in midfoot, shorter tongue, hard heel counter gone (easier on the Achilles now). Overall an improvement over last year. Forefoot strike compatibility? Not sure of your shoe history, but here are some options – the Nike Pegasus 31, Vomero 10, Saucony Ride 7, Saucony Breakthru, Adidas Glide Boost. Thanks! Would you recommend the FLK3 for a forefoot striker? Thanks, do you have a personal preference? P.S Are you a forefoot striker? Yes, the front end is responsive enough. Personally, we would prefer the Pegasus; there are forefoot strikers on the solereview team. Yes, I currently have a pair of the peg 31’s, should I wait for the 32’s or get the FKL3’s? Thanks. The 32’s have the same midsole as the 31 so logically both should feel the same – unless Nike changes the midsole foam density. Awesome! Thanks for the help; I’ll be sure to recommend you guys to my friends! Would the Adidas Glide 7 Boost be a good shoe for a forefooot striker? I run about 5K daily and my previous shoe experience is the nike pegasus line. I particularly enjoyed the 31’s. Thanks! Yes, the Glide 7 is suitable for forefoot landings. Stable base, and cushioning to go. I also enjoy the Brooks pure series for forefoot striking. Currently, my original PureFlows from 2012 are taking most of my miles. Not sure how the 4th version runs, but I think we’ll eventually see a review of those here as well. Which model do you prefer as a daily trainer (5-10K)? I think the Nike Flyknit and Pure Flows are both great for daily training. My main problem with the Flyknit (I have the first version, not v3) is that the forefoot is/was a little too tight. I think they shrank. The second problem I had is the outsole wears pretty quickly, but they’ve changed the outsole since, and it’s probably more durable now. For me, the fit was better with the Flows so I think they are probably my preferred trainer, this week anyhow. I also liked their fit over the Pure Connect, and liked the softer cushioning for doing 13+ mile runs. If you’re used to the lower drop shoes, I think the Pure Flows are an easy-going shoe for any distance. Hmmm.. My previous shoes have all been neutral nike shoes (peg 31, vomero 9) and I don’t have much experience with low shoes so would you still recommend those shoes? Well, if you’re putting it into the rotation, then yes. That is, there may be a little getting-used-to period, but nothing that would derail a normal training rotation. I personally like mixing up the shoes and trying different things to make running interesting and, I guess, theoretically work different muscles, etc. At least that’s what I tell myself to justify buying more. If it’s going to be your only shoe, then you might want to stick to what works. There would be no adjustment from a Pegasus to Flyknit Lunar. Is there a free source for sales figures of running shoes? As far as we know, there is no one resource which compiles sales data for footwear. But if you were to look into quarterly and annual financial reports of publicly listed brands (most are), the statements mention revenue by category and geography. That should give you the detail you are looking for. Since this was the last Asics review, I’m bringing it here: Gel-Quantum 360 will be available July 15, do you plan to review it soon after that or when? I so want a pair but I rather wait until your expert advice happens. Thank you. It is on our radar, we’re targeting end of July – first week August. I just got into running and of course these were the shoes I bought. The thing is I love the fit of the upper. They hold onto my feet and most importantly they don’t pinch my toes which every other shoe seems to do to me. Is there another shoe that fits similar to this one in terms of the upper and toe box, but offers better cushion? 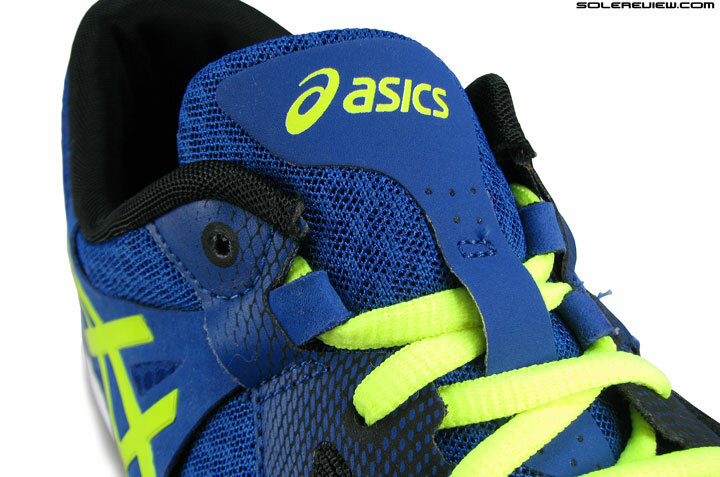 You should definitely try the Asics 33FA, a more cushioned version of the DFA. Not sure what the exact nature/cause of your pain is, so can’t help here! I love(d) my asics 33 gel lytes in everything except durability. (The uppers are a mess after 6 or so months, although they still have something to give on hard surfaces).. I’ve just got some Nike pegasus 31s for building up to a half marathon, but know they won’t have that same light as air feeling as the gel lytes. I was hoping the dfa would be a good replacement, but didn’t like them when I tried them on… a very different feel in every way. Any suggestions for a better replacement for 5ks etc as I’m hoping the pegasus will fit the bill for anything longer? ((I only took up running last year at 40, so I’m not exactly fast, but hate heavy feeling feet. 5ft6/140lbs)Thanks. How about giving the New Balance 1500 v1, Fresh Foam Zante or the Nike LunarTempo a try? Great for those short distance races, both are very lightweight. And as you can see from our review, we’re not exactly a fan of the DFA. We don’t recommend the 33DFA and have not the Gel Craze. We’ll be unable to help here – sorry. Unless you can lay out some options with a brief on what you’re looking for in a shoe. You’ll need to provide the name of a few shoe models available at your location, and which also fits your budget. The comments/Q&A thread will be closed till January 17, 2016. Premium access members can continue to use their dedicated comment section.